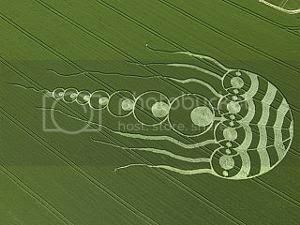 A spectacular crop circle shaped like a jellyfish has appeared on farmland in Oxfordshire. Jellyfish crop circle appears in field .The 250m (600ft) design, which turned up in a field near Ashbury last week, is believed to be the first of its kind in the world. Crop circle expert Karen Alexander said: "We have seen butterfly and bird patterns in the past, but this is the first jellyfish crop circle in the world. "It is absolutely huge - roughly three times the size of most crop patterns and extremely interesting. People have been aghast at the size of it. It is a complete monster. "We are looking into the meaning of it, but at present it just seems to have appeared out of nowhere." The owners of the land say whoever created the design caused about £600 of damage - but they called the shape "beautiful" and say they have reported the trespassers to the police. 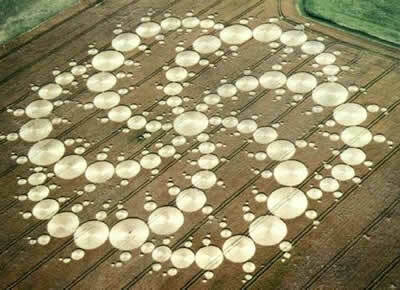 For a while there in the 60's & 70's crop circles were popping up all the time some really amazing ones. This is just so Beautiful. it showed up in the space of 3 hours. The farmer who's field it was in. He was keeping watch that night as they had turned up in his fields before, he had gone back to the house for a while when he came back there it was. These are photos of some that have turned up over the years here in the uk. This is a great web site. Watch the you tube vids at the bottom..